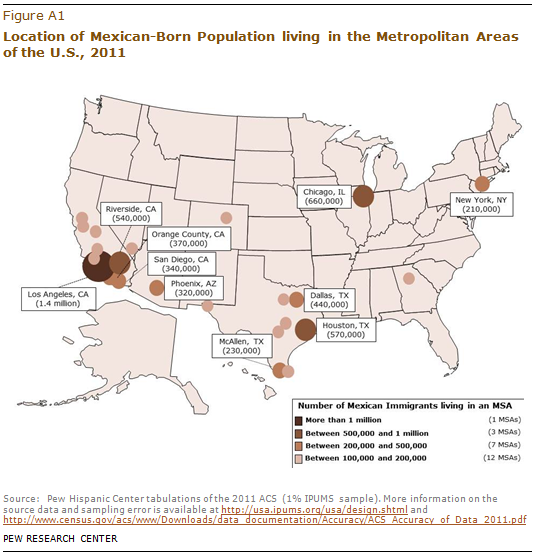 Appendix A: Geographic Distribution of Mexican Immigrants in the U.S. In 2011, 1.4 million, or about 12% of all Mexican immigrants, resided in the metropolitan area of Los Angeles, Calif. An additional half a million (5%) lived in the Riverside-San Bernardino metropolitan area, and about 300,000, or 3% of all Mexican immigrants, lived in each of the metropolitan areas of Orange County and San Diego. In addition, 6% of all Mexican immigrants lived in the metropolitan area of Chicago, Ill. About 13% of all Mexican immigrants resided in three Texas metropolitan areas—5% in Houston, 4% in Dallas and 2% in McAllen.